Today, I have it on my heart to share with all of you an amazing story of love and blessings. One of my younger sisters has always wanted children since we were very young. It was something she always spoke of and could hardly wait for. Her huge heart was ready to love lots and lots of babies, but unfortunately, soon after she was married, she found that her dream family was going to be a lot more difficult than the average family. After going through all sorts of medical treatments, her and her husband decided on Invitro Insemination as the method to start their family. I wont go into too much detail, but her twin boys were born happy and healthy. A bit later, they decided to have another child through this same method. Another son was born and they now have three beautiful and healthy children. They felt so blessed and overjoyed to have all those little feet running around. They felt that their family was complete, and they were so blessed. However, just when we decide that our life is exactly how we want it to be and everything is planned out, God tends to laugh, and remind us that really, our lives are in his hands. Recently my sister called to share some news with me. She was feeling very sick, gaining wait, and decided to take a pregnancy test. The miracle in all of this was that, without any help, any medical care, and certainly without their usual method of invitro insemination and lots of prayers, they had become pregnant! Fast-forward to today when she was finally able to get an appointment with her doctor to check everything out. Today, she found that she has a healthy little baby growing inside her! What a fantastic little miracle. This little story serves as a reminder that in our darkest hours, we are still loved. When we least expect it, miracles happen. 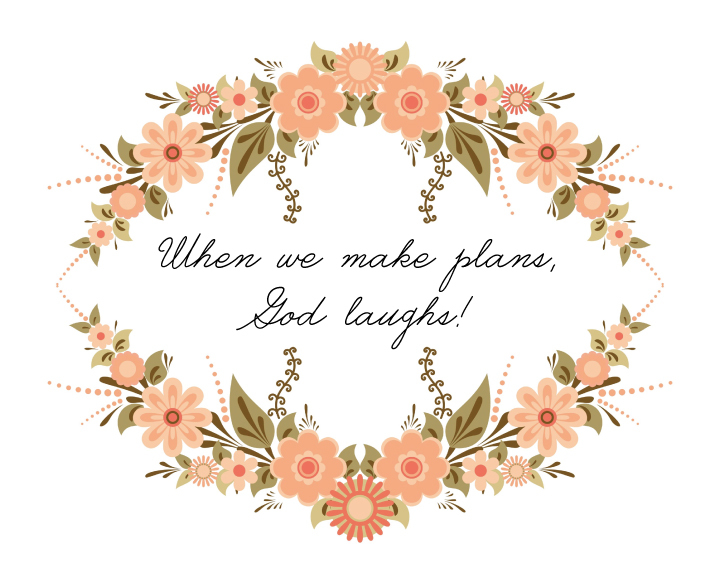 When we make plans, God laughs! And most importantly, love is all around us. Don’t forget to head over to With Love Paper Goods for Sara’s post today as part of our 28 Days of Adding Happiness series. Much love! 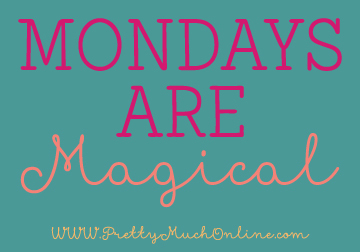 It’s been a few weeks since I posted up a Monday’s are Magical post. I really had intended to put one out soon, but sometimes when life is good, you just have to spend your time soaking it up! Things just keep getting better and better. I’ve had a ton of inquiries in the Etsy shop, and just last night, I got a really big surprise. I’m not an INTERNATIONAL seller having made my first sale to a sweet lady in Australia last night. Apparently, I’m kind of a big deal! I could not be more excited about that! I practically had to pinch myself because some days it’s hard to believe that this is real life and that I left my 9-5 for this amazing life! As you may have read yesterday, I just announced a new project collaboration with a Sweet lady named Sarah who lives in the Nashville area. Her adorable shop, With Love Paper Goods, is so much fun! The two of us will be teaming up to bring you 28 Days of Adding Happiness, because everyone knows we can always choose to be even happier than we are. It’s a project that is so dear to my heart, and I can’t wait to start sharing the series with you next week! Of course, I am still working with Josephine over at Courage & Dash as a guest blogger. The latest DIY will be up really soon. It’s a fun one, so you will have to head over to her blog because you won’t want to miss it! Lastly (is that a word? ), I am really looking forward to Friday night. While the rest of you are sleeping in your beds, I’ll be flying above your heads on my way to Florida. The Mr and I are taking another trip to Walt Disney World. This year we have a lot to celebrate: 1) Our One Year Anniversary, 2)The success of Pretty Much as well as the new beginnings we have both started between school and work. and finally, 3) Over a year has gone by since my symptoms began, and now, although I still have a lot of trouble walking, driving, and generally doing everyday things, I’m on the mend and feel like life is finally getting back to normal, so we will be celebrating progress. His cousin, Krista, who was also one of my bridesmaids, is coming too. I cannot wait to celebrate with her over her first Disney trip. It’s always such a fun experience to be with somebody for their first time there! Well, I hope you all have a wonderful week! All my love! Some days it seems as though people believe that happiness is a lofty goal. We rush through life chasing a dream of happiness saying things like, “I’ll be happy when I get that new car.” or “I’ll be happy when I take that vacation,” but as soon as we reach one goal or can afford a special treat, we barely stop to enjoy it before we are off running after the next thing that will be sure to bring us happiness. About a month ago, Sarah, from With Love Paper Goods approached me about doing a blog series with her to promote happiness. I was on-board immediately, but as we talked about our ideas, I became even more excited. With all the amazing things going on in this world, we somehow forget to make time to be happy. Sadly anymore, it seems like we almost have to pull out our day planner and pencil it in: “5:30 PM be happy.” Well, we are hoping that with this blog series, we will be able to remind you that it’s the little things in life that make up the big happiness picture. You don’t have to pencil happiness into your date book, you simply have to realize what makes you happy. 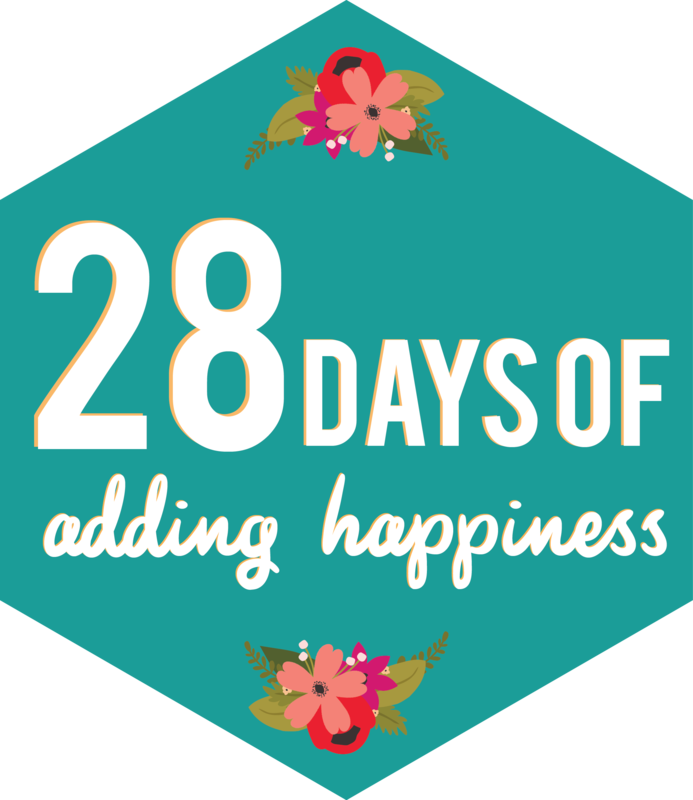 28 Days of Adding Happiness will be a blog series with a little twist. Sarah and I will be taking turns each day posting up some really lovely things: DIYs, recipes, links, printables, and lots more. I really can’t wait! All of this fun will start a week from today on Sunday, august 17th over on Sarah’s blog. Each day after that, for 28 days, we will share some pretty wonderful things with you. I hope you’re on board because this is going to be so much fun! 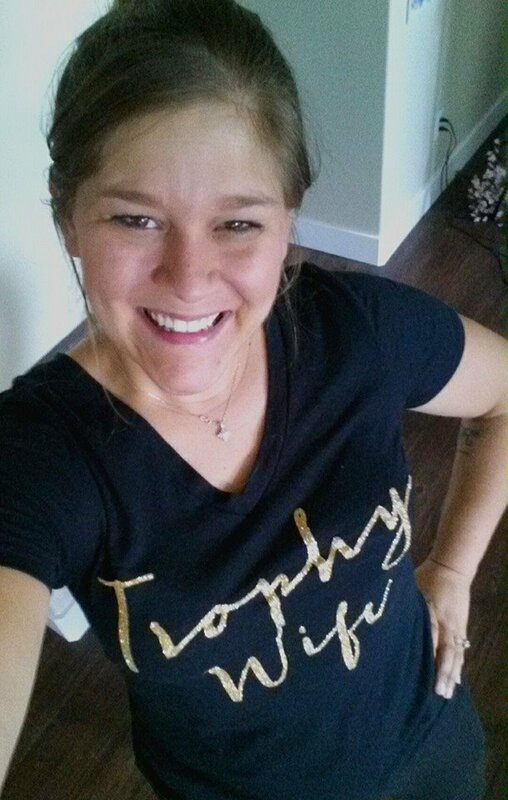 Coming up: Meet Sarah this Thursday, when I interview her here on the blog! A Huge Announcement: Guest Blogging! Last week I told you all on the twitter and facebook feeds that I would be making a huge announcement this week. It has been killing me to keep this huge secret for nearly a month! Finally though, I can spill the beans. (Who came up with that saying, anyhow? I think it sounds kind of silly!) The lovely Josephine Mills from Courage & Dash got in touch and has asked me to be a regular guest DIY blogger for her beautiful London-based blog!!!! <———This deserves about a million exclamation points! I know, I’m just as stunned and excited as all of you probably are. This is such a huge honor! Yesterday, my first post went live. It was a super fun and super easy DIY. 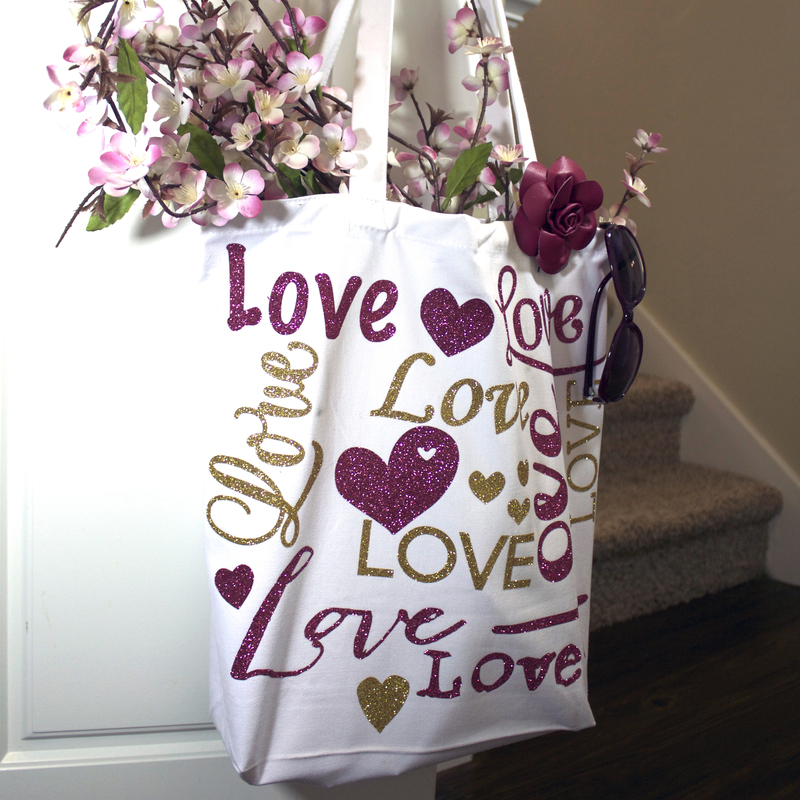 Do you remember those adorable totes I put up in the shop on Sunday night? Well, now if you feel up to it, you can make them yourself! I know, I know, Pretty Much amazing! I highly suggest that you head on over to the Courage & Dash blog, and check out, not only this easy little DIY, but also the rest of Josephine’s blog because I really think you are going to adore it! Going into the weekend, be safe and have fun! My “day job” or the job that I have in order to afford the mortgage payment is a pretty interesting one. If I were to break down my job description into one sentence, I train soldiers to maintain and repair unmanned aircraft (drones if you are into Call of Duty). I used to fly them myself, but now I just do the dirty work! As most people in my field attain their training from the military, my position is considered Entry Level despite over 6 years in the field, nearly 3,000 flight hours, Instructor certification for flight and maintenance, etc, etc. I was the low man on the totem pole. How does a high school cheerleading captain, color-guard captain, pep club member, founder of the Spirit squad, student counsel treasurer, honor-roll student, art club member end up training soldiers to fly drones in Iraq and Afghanistan? Yeah, I have no idea! I often wonder that myself. I especially wonder how all that happened while I simultaneously studied/ taught photography, studied Interior Design, studied Graphic design, and visual communications. Somehow despite my right-brained creative self, I managed to also be a complete science/math nerd and get ahead in a male-dominated world. All this time I have been sitting at home recovering from the craziness of my inner ear problems, I’ve been contemplating this all more and more. I’ve been thinking about the things that truly make me happy and the things that I really love to do. I started to spend my free time creating decorations for weddings, designing logos for small businesses, and trying to figure out how I could possibly do this type of thing all the time. Fast-forward to last week, when I finally got the okay to start working from home at my “day job” again. I was finally in the later stages of recovery where I would be able to sit in front of a computer and re-establish all of my certifications through reading technical manual after technical manual. As much as that sounded like pure torture compared to making pretty things every day, I knew it was going to pay the bills and I was prepared to jump right back into that life again, but then the phone rang. In a matter of minutes I went from that entry-level position studying manuals and technical language, to being unemployed. They no longer needed me. I wanted to cry…and then I realized the reason that I wanted to cry wasn’t because I had lost my day job, but it was because I was finally free from my day job. I was finally free to pursue my dreams of owning a business; free to work from home, to create pretty things, and to love what I do for a living! In that moment I realized that I wasn’t an unemployed mechanic. I was the CEO of an incredible Design business called Pretty Much, and my dreams were coming true! A blank screen and a blinking cursor – Yikes! I started my business back in December, but I’ve put off the obligatory first post for the blog simply because it overwhelmed me. Starting a business is easy, but blogging your thoughts is really scary! I fought with myself over what exactly the perfect content was for an initial post. I have so much to share with the world that I just could not decide where to start. I want to introduce myself, explain the roller-coaster year that ultimately led to me becoming a small business owner, and of course talk about all my goals of last year while listing my excuses for not completing more than few of them! The cursor kept blinking and the blank page stared back at me! Forward to this morning. I woke up, showered, decided there was no time like the present to begin a new practice of oil pulling, threw on some clean pajamas, and sat down at my computer. All current projects could wait; I just had to write that first blog post. I had to begin today or I would continue to put it off everyday until the point of having a blog was completely lost and my enthusiasm for new beginnings went out the door with it! I sat down, took a deep breath, and then took several more. My mind was blank. I took another deep breath and placed my fingers on the keyboard. Nothing came to me. I decided that eating a cookie (a home-baked snickerdoodle of course!) was the missing piece to the puzzle that once complete would picture me, a complete success, jumping up and down as glitter fell around me. The outcome wasn’t quite that dramatic, but while eating that hard-as-a-rock-because-I-got-distracted-and-left-it-in-the-oven-for-a-half-hour cookie, it occurred to me in the most cliche fashion that perfection was over rated, and if the story of my morning was good enough to make me chuckle, it was good enough for my first blog post. So what can you expect when reading the Pretty Much blog? Oh…pretty much anything! There will be posts about new beginnings, starting a business, and setting goals. There will be posts with pretty pictures, some creative ideas, and lots of glitter could be involved as well! Pretty Much is a design studio based in Utah, and I, Renay, am the Art Director. I create small business branding packages with logos, color schemes, stationary, etc. I create gorgeous party decorations, event themes, and wedding packages. Lastly, I am the creator of the Pretty Much Pretty Busy calendars, planners, and organization tools. 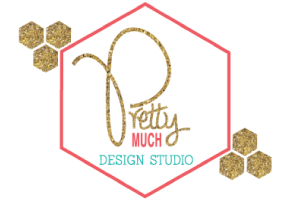 You can find me on my personal Pinterest page, the Pretty Much website, the Pretty Much facebook page, the Pretty Much Pinterest page, the Pretty Much Etsy shop, and the Pretty Much Twitter page @HelloPrettyMuch. Please do stop in to say hi! Comment as much as you can or want. I do my best to respond to all of my followers. Let’s have fun! Come back often for new blog posts. I’ll be starting a blog schedule soon to include featured posts. You will not want to miss all the great things in store for 2014. Oh, and don’t worry, glitter will be involved!